Like most people that have grown up hearing the stories of World War 2, coloured through the lenses of Hollywood and British and American writes, I thought I knew all about the brave pilots of the RAF defeating the Luftwaffe and the heroes of Bletchley Park cracking the Enigma codes. Then, moving to Poland, the story is completely different! It was the heroic Polish pilots of the 303rd squadron who almost single-handedly kept Hitler from the British Isles. And the Enigma was broken by a group of Polish mathematicians who gave the solution to the British when Germany invaded Poland. As the story of the Enigma is told from a British perspective the Poles hardly feature at all. This is especially true after films like The Imitation Game. In the Polish version of the story it is another group of genial mathematicians that solve the puzzle: The Polish Biuro Szyfrów gave to solution to the British and they simply took the drawings, built the Bombes and never gave credit where credit was due. Turing, Dermot. X, Y & Z: The Real Story of How Enigma Was Broken (Kindle Locations 115-120). The History Press. Kindle Edition. But what really surprised me, having heard both the Polish and British side of the story, was the extent of the French involvement. Nowhere had I heard about Gustave Bertrand and his invaluable spy, Hans-Thilo Schmidt. I didn’t know that it was the French that delivered to the Poles the instructions for how the Enigma worked, allowing them to reverse-engineer and crack the Enigma code. I didn’t know that it was only via the French intelligence that the Poles and the British had any contact, and I didn’t know that Biuro szyfrów continued their work in unoccupied France, even as the Germans were closing in. 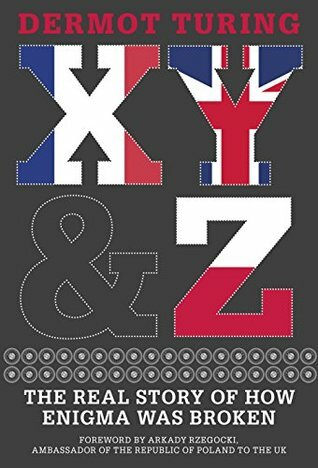 X, Y & Z tells a balanced story of how the French, British and Polish (the title’s X, Y & Z) code-breakers together attack the German codes, much more efficiently that any of them could have done on their own. We meet a colourful cast of protagonists1 that we follow through the war. Although the book sometimes loses focus and tempo, it’s a compelling story that deserves to be more widely known. Although, so numerous that it’s sometimes hard to remember who’s who.